SCVHistory.com LW3264 | Film-Arts | Harry Carey Jr. in 'Gremlins' (Warner Bros. 1984). Harry Carey Jr. in "Gremlins"
AAAAAAAAHHHHH! Saugus native Harry Carey Jr. (as Mr. Anderson) freaks out in the Steven Spielberg-Frank Marshall-Kathleen Kennedy production of "Gremlins" (Warner Bros./Amblin Entertainment 1984). Lobby card, standard 11x14 inches, issued by National Screen Service Corp., distributor of trailers and other promotional materials for film studios. Serially numbered 840040, which means it was the 40th movie handled by NSS in 1984. 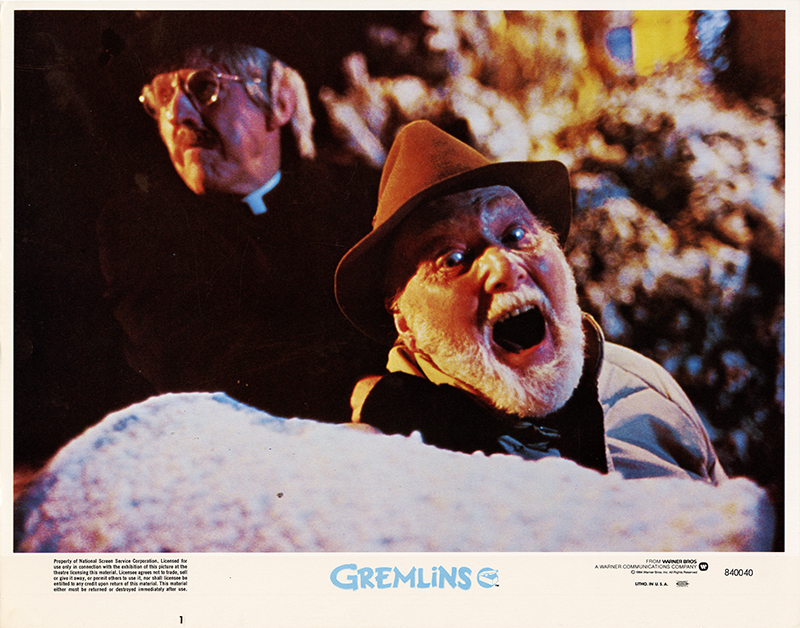 "Gremlins" was released in U.S. theaters June 8, 1984. LW3264: 9600 dpi jpeg from original lobby card purchased 2018 by Leon Worden.